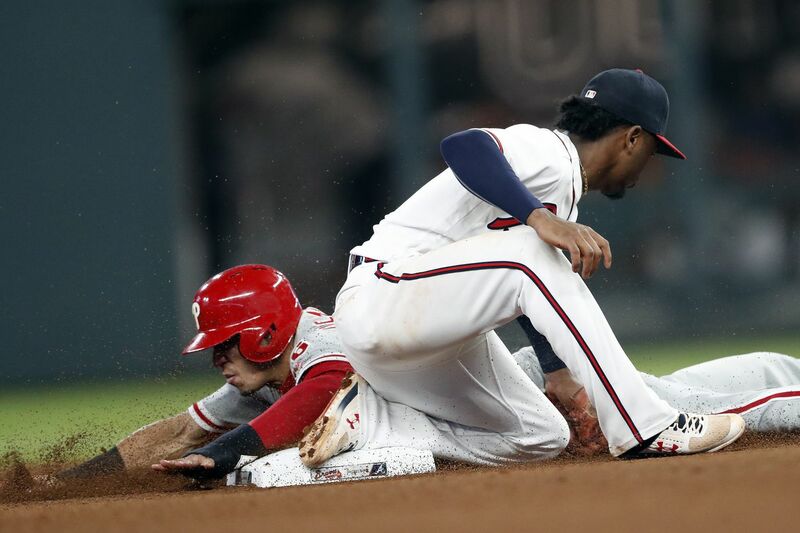 Phillies infielder Cesar Hernandez is tagged out by Braves infielder Ozzie Albies on Thursday. ATLANTA — Stone-faced and appearing almost solemn, Tommy Hunter handed over the ball in the seventh inning here Thursday night. And as he made his slow march back to the Phillies' dugout, the hypnotic chant of the Tomahawk Chop arose from the crowd and the ballpark lights dimmed. Ten days from the end of the regular season, the lights are nearly out on the Phillies. They came here with their hopes of winning the National League East dangling by a thread. They need to take at least three out of four games against the division-leading Atlanta Braves to have a chance in the final week of the season. Really, though, they probably needed a sweep. That won't happen. Not after a self-inflicted loss in which the defense faltered, the offense vanished and Hunter gave up the go-ahead run on back-to-back doubles by Dansby Swanson and pinch-hitting Lucas Duda, a Phillies killer since his days with the New York Mets. Luis Garcia and Austin Davis combined to allow four more runs in the eighth inning, and the Phillies fell, 8-3, before an announced crowd of 27,474 at SunTrust Park. "It's unfortunate," Hunter said. "It's definitely putting ourselves in a little bigger hole than what we would have wanted." Here's the daunting math for the Phillies: They trail the Braves by 6 1/2 games with 10 games left to play. Any combination of four Phillies losses and Braves wins will give Atlanta its first division title since 2013. If the Phillies don't lose again, the Braves would have to go only 3-6 to finish in a first-place tie. Lights out? Yeah, pretty much. "We're not out of it," Rhys Hoskins said, defiantly. "I know the guys in this room don't think that." Gabe Kapler pulled out all the stops, as only the Phillies' progressive manager can. He asked hard-throwing starter Vince Velasquez to "really step on the gas" with his fastball and not worry about going deep in the game. And after Velasquez got through three innings, Kapler turned to his 16-man bullpen and called on seven relievers — but neither Seranthony Dominguez nor Hector Neris, both of whom, Kapler explained, were available if the game had stayed tied or the Phillies got a lead. Once again, though, the defense was a sieve, the offense a disappearing act. And once again, the Phillies were slayed by those deficiencies. "There were a number of plays that we could've executed more successfully, for sure," Kapler said. –Carlos Santana, a first baseman who was playing third base and positioned at shortstop in the Phillies' shift, was unable to knock down Freddie Freeman's single in the first inning. Nick Markakis followed with a game-tying RBI single. –One batter later, Hoskins — playing first base because Velasquez's tendency to get fly balls prompted Kapler to start defensively superior Aaron Altherr in left field — started a double play by stepping on first rather throwing to second, a decision that allowed another run to score before the play was completed. "It being the first inning, I think you have to get two outs there," Hoskins said. "I chose not to force a throw. Hindsight is 20-20. I think if I could do it again I would go to second base instead of step on first." Said Kapler: "Certainly at that point the run is important. But it's a judgment play and we trust Rhys." –Altherr couldn't hold hustling Swanson to a single in the seventh inning. Kapler, unfailing protective of his players, believed Altherr "can be more aggressive getting to that ball" and said he planned to speak with him "to hear what was on his mind." But Altherr explained that it's best to play conservative in the outfield here. "The ball really snakes out there, so it's really tough to charge balls," Altherr said. "I really wanted to charge a little harder, but just knowing how it plays, I don't want to charge it super hard, get by me and it gets even further." Despite the miscues, the Phillies had 1-0 and 3-2 leads after the top of the first and third inning, respectively. They had five hits and two walks through three innings against Braves starter Kevin Gausman, who was on the ropes after throwing 69 pitches. But Gausman needed only eight pitches to get through the fifth inning and nine to complete the sixth. After giving up back-to-back RBI singles to Odubel Herrera and Jorge Alfaro in the third inning, he retired 11 batters in a row and pitched into the seventh. The first out of that stretch was the biggest, by far. The Phillies had taken a 3-2 lead and were set up for more with runners on the corners and two outs in the third inning. But Gausman got Altherr to swing through a splitter for a rally-killing strikeout. "You definitely want to come out and win the first game in a 'must-win' situation at this point in the season," Hunter said. "We could've pitched better. I could've pitched better." Said Hoskins: "Disappointed is the word. They're a good team, and they showed that tonight. But we still have a chance to make some noise the last three games here and take care of business in Colorado and go from there." The Phillies' chances couldn't be any slimmer.